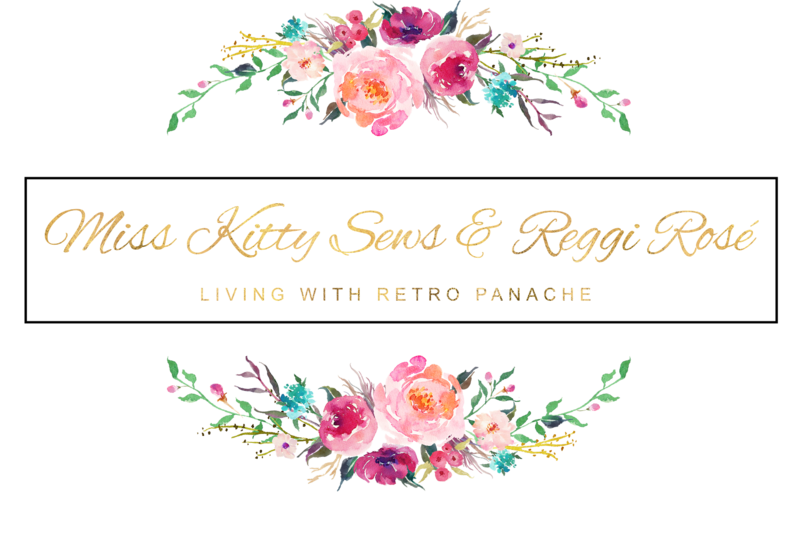 The sewing-bug bit a few days ago... now, I'm elbows-deep in beautiful flamingo print fabric, creating a 1950's style poolside dress for Viva Las Vegas Rockabilly Weekend #20! Front and center! A gorgeous flamingo swimsuit! I searched Google Images and Pinterest for ideas for a poolside dress from the 40's-50's. Though I found a lot of pics of beautiful swimsuits, I didn't find much of poolside dresses. However, I did find this one and it sparked a few ideas for one! 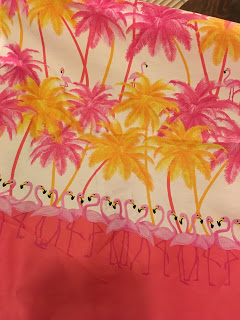 The prettiest flamingo fabric I've found yet! I really should have bought the whole bolt... I only have 5 yards here. I cut the top 18" off. This number came from the subtracting the total width of the fabric by the length desired for the skirt (plus some margin/allowance for sewing pieces together and finishing ends). I'm using the full length of 5yards for the skirt (a rectangle skirt). The next step I did was hem the bottom of the skirt. I folded the selvage under, and then folded it under again. Then I sewed along the edge. The right side of the fabric should look something like this. Next, I sewed a basting stitch along the top of the skirt fabric. There are two strands of thread at both ends. Starting from one end, I grabbed one thread and started to gently pull to gather the fabric. Essentially, I'm gathering 5yards of fabric into roughly 50". Pull on one to start gathering. Next, I created the waist-band. The 18" inches of fabric I cut off earlier was sized down to 8" in width and roughly 50" in length (to match the length of the skirt), and then pinned to the skirt (right sides of the fabric together). After pinning, I carefully sewed the pieces together. I'll be working on the top portion next. Stay tuned for another post documenting part 2 of this sew-along. If you have any suggestions or questions about part 1, I'd love to hear from you!